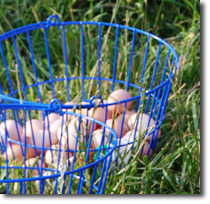 The chicks are housed in a “Hen Condo” and follow the cows in their grazing rotation. 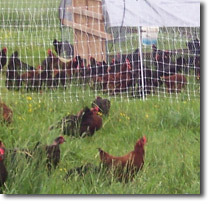 The Condo is an 8’ x 16’ portable henhouse allowing the laying hens free-range within secured electrified netting. Sweet Pea and her calf, Clover, are grass fed with a small amount of all natural, non GMO grain from a local provider, Sunrise Farms. Our grass is rich and ample, and hay fed during the winter months is straight from our clean, non-pesticide grass. Small amounts of grain are given to keep our girl content in the headlock and support our local producers. Somerset Farms use 9’ x 9’ x 6’ high floorless, portable field coop housing accommodating 40-50 birds growth room for the eight-week stay. Moved daily to a fresh pasture paddock, these birds receive fresh air, exercise, sunshine, and fresh greens. 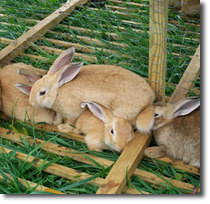 The rabbits are housed in elevated pens above the chickens in a custom-made pen called the “Raken” (Rabbit-Chicken) house. The breeding stock receives unmediated alfalfa pellets and hay or cut-and-carry fresh greens. We keep layers for two production years. At the two-year cycle, their production cycle diminishes and is dressed out. Although they are tougher than the young broilers, the taste is superior and the broth is delicious. Herbivores in nature exhibit />three characteristics: mobbing for predator protection, movement daily onto fresh forage and away from yesterday’s droppings, and a diet consisting of forage only – no dead animals, no chicken manure, no grain, and no fermented forage.